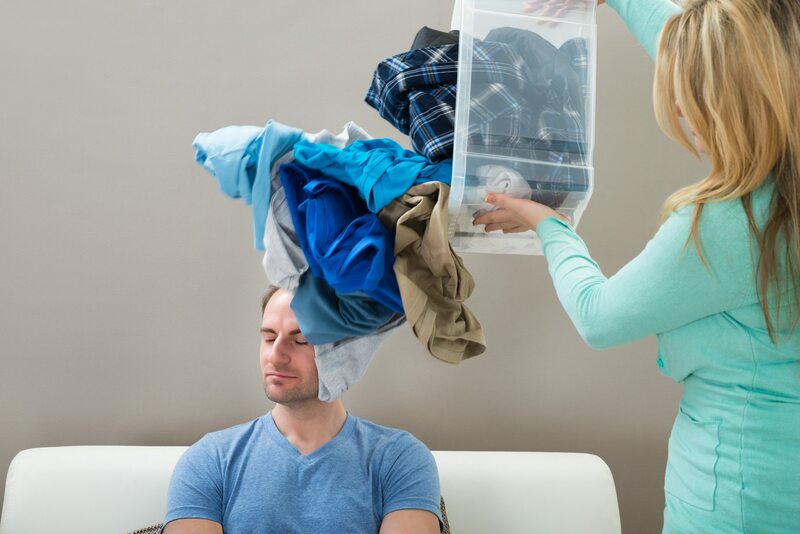 A MARRIAGE DILEMMA: What do you do if one of you has the natural inclination to be messy and this greatly upsets the other spouse because he or she likes things neat and tidy? That’s the subject of this Marriage Message because of the “nagging” problem it sets off in a lot of marriages —on that isn’t always dealt with in peaceable ways. “For your husband to expect your inner maid to miraculously appear just because you’re now a stay-at-home mom, and for him to think he no longer has to pitch in, is very unfair. However, your stubborn stance against altering your cleaning aptitude (probably brought on by his new, surly attitude) isn’t good either. “Marriage is a compromise situation. You were smart enough to discuss your limitations and expectations before you made your vows— and you should have talked about your new roles as homemaker and breadwinner before that life-altering decision to have a child. “That said—it’s not too late now. Discuss your feelings, and brainstorm ideas to reach a happy middle ground. For example: Your husband wants to relax in a clean living room after work. You sympathize, then (because he referred to the home as your office) remind him that when he comes home you’ve also been on the job all day with household errands and your child. The plan: Share the overtime. You cook; he washes dishes. You make his relaxation area clutter-free while he bathes the baby and gets him ready for bed. • “Keep your eyes wide open before marriage and half shut afterward.” That advice can sure apply to housekeeping habits as well as other areas of life together! Don’t forget to give each other grace and overlook that which can be, for the sake of the relationship. As for that, which you can’t overlook, ask God for wisdom in how to approach the situation with a forbearing spirit. First prayer —then share. • “Never let a problem to be solved become more important than a person to be loved” (Barbara Johnson). “The entire law is summed up in a single command: ‘Love your neighbor as yourself.’ If you keep on biting and devouring each other, watch out or you will be destroyed by each other“ (Galatians 5:14-15). • Keep in mind that in marriage you’re a team. Your goal is to attack the problem—not each other. Sit down at an agreed upon time (when it isn’t a H.A.L.T. time —when either of you is Hungry, Angry, Lonely, or Tired). Then strategize how you can work it out together to bring order into your house into your home so you’re both satisfied (to the degree it is possible). • If at first you don’t succeed —try, try again! You may find this to be a life-long problem that will need to be dealt with again and again. Just remember to be patient with each other as you can with the grace God can give you as you call upon Him. As they say, “Rome wasn’t built in a day” and surely that would also apply in keeping it clean! “You were called to be free. But do not use your freedom to indulge the sinful nature; rather, serve one another in love“ (Galatians 5:13). • “Old patterns will persist if serious effort is not made to change them.” Seriously and patiently work on this together. Of course, we believe these principles of giving grace and communicating openly over differences apply to more than just dealing with who’s “messy” or who’s a “neat freak.” In every relationship there are going to be differences. The challenge is to learn how to work through them in a healthy, God-honoring way. (SOUTH AFRICA) Some of the messy environment could be avoided before it even builds up and cause stress to either partner. This tip might help to avoid a messy environment: If you open it, close it; if you drop it, pick it up; if you take it out to use it, take it back; if it is dirty, drop it at a designated place; if you make it dirty, clean it up; and etc. This will help to at least keep the house tidy, and lessen the stress. Thanks.